Non-dispersed. These systems include spud muds, natural muds and other lightly treated systems that are generally used for shallow wells or top-hole drilling. Thinners and dispersants are not added to disperse drill solids and clay particles. Dispersed. At greater depths, where higher densities are required, or where hole conditions may be problematic, muds are often dispersed, typically with lignosulfonates, lignites or tannins. These and similar products are effective deflocculants and filtrate reducers. Potassium-containing chemicals are frequently used to provide greater shale inhibition. Specialized chemicals are also added to adjust or maintain specific mud properties. Calcium treated. Divalent cations, such as calcium and magnesium, when added to a freshwater drilling mud, inhibit formation clay and shale swelling. High levels of soluble calcium are used to control sloughing shale and hole enlargement, and to prevent formation damage. Hydrated lime (calcium hydroxide), gypsum (calcium sulfate) and calcium chloride are principal ingredients of calcium systems. Calcium-treated muds resist salt and anhydrite contamination but are susceptible to gelation and solidification at high temperatures. High-performance water-based muds (HPWBM). These are usually reformulated polymer systems containing system-specific products to deliver shale stability, clay and cuttings inhibition, lubricity and high ROP, while minimizing bit balling/accretion and downhole torque problems. Some HPWBM use borehole stabilizing products to reduce pore pressure transmission similar to oil-based muds. Therefore, HPWBM are suitable to use whenever environmental liabilities and associated waste management costs limit the application of OBM/SBM. Low solids. Listings include systems in which the amount (volume) and type of solids are controlled. Total solids should not range higher than about 6% to 10% by volume. Clay solids should be some 3% or less and exhibit a ratio of drilled solids to bentonite of less than 2:1. 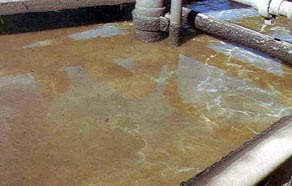 Low-solids systems typically use polymer additive as a viscosifier or bentonite extender and are non-dispersed. One primary advantage of low-solids systems is that they significantly improve drilling penetration rate. Polymer/PA/PHPA. Muds incorporating generally long-chain, high-molecular-weight polymers are used to either encapsulate drill solids to prevent dispersion and coat shales for inhibition, or for increasing viscosity and reducing fluid loss. Various polymers are available for these purposes, including cellulose, natural gum-based products, and acrylamide. Frequently, inhibiting salts, such as KCl or NaCl, are used to provide greater shale stability in all of these fluids. These systems usually contain a minimum amount of bentonite and may be sensitive to divalent cations, such as calcium and magnesium. Most polymers have temperature limits below 300°F but, under certain conditions, may be used in hotter wells. A special class of water-based muds use partially-hydrolyzed polyacrylamide (PHPA) as an additive, either to encapsulate drill solids or to extend bentonite clay in a low-solids mud. Saltwater systems. Several mud systems are included in this classification. Saturated salt systems are used to drill salt formations. Lower levels are usually referred to as brackish or seawater systems. Saltwater muds are usually prepared from brackish, seawater or produced-water sources and dry sodium chloride (or other salts, such as potassium chloride used for shale inhibition), are added to achieve desired salinity. Various specialty products, such as attapulgite, CMC, starch and others, are used to increase viscosity for hole-cleaning properties and to reduce fluid loss. try to find so many ways by applying various skin products or homemade products on their skin. you wash or touch something.